Miriam Elizabeth Croft-Kent, 95 of Lodi, Ohio passed away Saturday, Sept. 29, 2018 at Burbank Parke Care Center in Burbank, OH where she had resided the past 2 years. 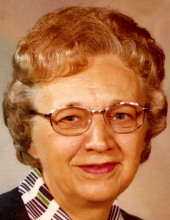 She was born Sept. 11, 1923 in Everett, PA to William and Ada (Ritchey) Miller. She married Hillis “Joe” Croft, and in 1957 they settled in Lodi. Miriam worked at the former Null’s Restaurant in Medina. Following her husband Joe’s sudden passing in 1973, she moved to Zephyr Hills, Florida. There she was employed as Cafeteria Manager for St. Leo’s College. While living in Florida she met her second husband Dwight Kent. They were married for 10 years, and following his death she returned to Lodi in 1997. She was baptized at and was a member of Lodi First Congregational Church. Miriam enjoyed embroidering and quilting, and loved the company of her family and grandchildren. She was also an avid Cleveland Indians fan. Visitation will be Wednesday, Oct. 3, from 4:00 – 7:00 PM at Parker Funeral Home, 210 Medina St., Lodi (330-948-1122). Funeral service will be Friday, Oct. 5, at 12:00 noon at Dalla Valle Funeral Home, 22 W. Main St., Everett, PA where visitation will be 1 hour prior to the service. Pastor David Dake will officiate. Burial will follow at Ritchey Cemetery in Everett. In lieu of flowers contributions may be made to Lodi First Congregational Church, 114 Church St., Lodi, OH 44254 or to Crossroads Hospice, 3743 Boettler Oaks Dr., Suite E, Green, OH 44685. "Email Address" would like to share the life celebration of Miriam E. Croft-Kent. Click on the "link" to go to share a favorite memory or leave a condolence message for the family.